This substantial church, nestling beneath the huge oil refinery, came to The Friends in 2005. It probably would have struggled on in use had not the refinery suffered a calamitous explosion in 1994 which shifted the roof of the church and led to the evacuation of the village. This Grade I listed, largely medieval, church with an especially tall Pembrokeshire tower, has a most unusual dedication. Decumanus was born nearby but sailed away to live a hermit’s life on Exmoor Having crossed the Severn in a coracle he landed near Dunster in Somerset where he lived the life of a hermit up to a supposed martyrdom in 706 ‘at the hands of a truculent fellow who cut off his head with a spade’. Even more striking for such a comparatively remote site, is the complicated ground plan which has 4 chapels or oratories, each built by the occupants of the 4 significant houses in the parish, including the remarkable and surviving tower house at Eastington. 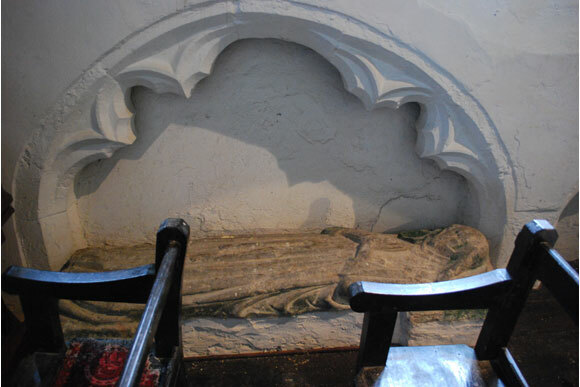 The interior retains a small rather animated late medieval figure of The Risen Christ high above the inner door to the south porch, several tomb recesses, one with a 14th century female effigy and a number of objects moved from Pwllcrochan church when that was converted to a house in 1994. The best of these is the very fine Rococo monument to F Powell of 1716 but the second of the church’s two 12/13th century fonts also come from the same source. The finely carved step into the north transept seems to be the remains of a 15th century altar tomb, no doubt dismantled at The Reformation.